Lance Corporal Thomas George Gatenby T9419 Enlisted in the Australian Army 18 July 1939 and served in the 12/50 battalion until his discharge 4 April 1941. 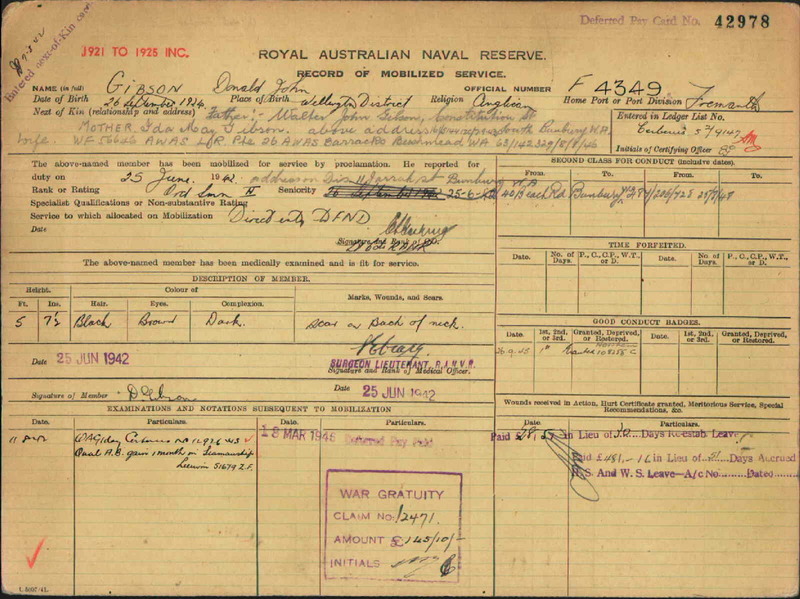 Lance Corporal Thomas George Gatenby T9419 enlisted in the Australian Army 18 July 1939 in Launceston Tasmania. He served in the 12/50 Battalion until discharged medically unfit 4 April 1941. Thomas George Gatenby was injured in a motor vehicle accident on the Bass Highway near Prospect. The article was published in the Examiner Newspaper, Launceston, Tasmania, Wednesday 28 June 1950. Thomas George Gatenby was seriously injured in a motor vehicle accident on the Bass Highway near Prospect, Tasmania on 27 June 1950. Details were published in the Examiner Newspaper, Launceston, Tasmania, Wednesday 28 June 1950. Thomas George Gatenby died 28 June 1950 at Launceston General Hospital as the result of an accident. Thomas George Gatenby died 28 June 1950 at the Launceston General Hospital. The death notice was published in the Mercury Newspaper, Hobart Tasmania on 29 June 1950, page 17. Thomas George Gatenby of 110 Tamar St, Launceston died in the Launceston General Hospital 28 June 1950 from injuries he received in a motor vehicle accident. Coroners Inquest into the death of Thomas George Gatenby. The funeral of the late Thomas George Gatenby left his late residence, 110 Tamar St, Launceston at 3 pm Friday 30th June 1950 for interment in The Carr Villa Cemetery. Thomas George Gatenby left his late residence, 110 Tamar St, at 3 pm Friday 30 June 1950 for Carr Villa Cemetery. Death Notice published in the Mercury Newspaper, Friday 30 June 1950, page 17. See attached death and funeral notices. In Loving memory of Thomas (Tom) George loved husband of Daphne Gatenby accidentally killed 28-6-50 aged 40 Years. [S173] Mary Cummins (n. Griffiths) (Reliability: 2), 16 Oct 1909. Thomas George Gatenby, Born 16/10/1909 in Tasmania have his headstone, I have requested more info from family members. [S34] National Archives of Australia, 1 - 4 (Reliability: 3), 18 Jul 1939. [S182] Examiner (Launceston,Tas) Newspaper (Reliability: 3), 28 Jun 1950. See attached Newspaper Clipping published in the Examiner Newspaper Launceston, Tasmania, Wednesday 28 June 1950. [S101] Headstone Inscription (Reliability: 3), 28 Jun 1950. [S97] Carr Villa Memorial Park Cemetery (Reliability: 2), 28 Jun 1950. Date of Death 28/6/1950 - see attached burial record details. [S182] Examiner (Launceston,Tas) Newspaper, 5s (Reliability: 3), 29 Jun 1950. Thomas George Gatenby died 28 June 1950 at Launceston General Hospital as the result of an accident. Published in the Examiner Newspaper Thursday 29 June 1950 - see attached newspaper clipping. [S138] The Mercury Newspaper, 17 (Reliability: 3), 29 Jun 1950. Thomas George Gatenby died 28 Jun 1950 at Launceston General Hospital - The death notice was published in the Mercury Newspaper, Hobart, Tasmania, on Thursday 29 June 1950, Page 17. See attached Newspaper clipping. [S172] Linc Tasmania, Tasmanian Government, (Tasmanian Government) (Reliability: 3), 29 Jun 1950. Coroners findings into the death of Thomas George Gatenby. [S182] Examiner (Launceston,Tas) Newspaper, 13 (Reliability: 3), 30 Jun 1950. See attached death notice published in the Examiner Newspaper, Launceston, Tasmania, 30 June 1905, Page 13. [S138] The Mercury Newspaper, 17 (Reliability: 3), 30 Jun 1950. See attached funeral notice published in the Mercury Newspaper, Hobart, Tasmania, Friday 30 June 1950, Page 17. [S97] Carr Villa Memorial Park Cemetery (Reliability: 3), 30 Jun 1950.